The principal business of the society is to arrange and attend public events. It is by this means that we are able to pass on our knowledge and love of the period, meet each other in interesting places, be seen, and maintain our high public profile. Events may be either arranged as local shows attended by members of the relevant group or major events needing attendance by its members on a national basis. The society is paid by its clients to organise these events and funds accrued from local events stay at local level. However, Regia Anglorum owns land in Kent on which we are building a permanent site, runs a small navy of five ship replicas and funds a number of on-going projects in a year. All monies earned by the society's members are held in common and managed for the good of all. We have no paid officers, but their expenses are often covered by pre-arrangement. Aside from public events, the society arranges training events, talks and specialist interest group meetings (cooking, embroidery, shield making, leather working etc) all over the country. We organise a conference every eighteen months or so, where renowned historians and archaeologists come and talk to us about the latest developments in their field. We are a busy active bunch and there is something happening somewhere on most weekends of the year. At some major events – but not all – there might be assistance with food or other on-site consumables. All shows are datelined in advance and may require members to take the	role of Saxons, Vikings, Normans etcas required, depending on event content. Assistance with travel by way of vehicle sharing is frequently arranged at group level. It must be said that we are a well-travelled lot and although the national events organisers do their best to arrange shows all over the UK, shows are rarely going to be close for a majority of the membership on any particular occasion. In our time we have worked for Durham, Gloucester, Worcester, Wareham, Bristol, Stafford, Rochester and many other UK City and Borough Councils. Six years annually at the Largs Vikingr! Centre, English Heritage, The National Trust, The Royal Armouries and The Museum of London. Ecclesiastical clients include Denny Abbey, St. Johns in Wareham, St Andrews in Chippenham, Rochester Cathedral and the Minster and St Olav's in York. The Jorvik Viking Centre in York is our oldest client and we have been their principal sub-contractor for over 30 years of Viking Festivals. Click on the button below to see our current diary. 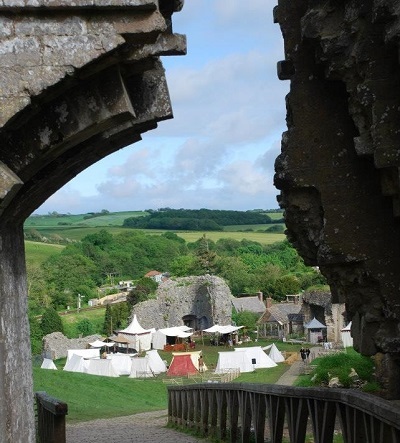 Over the Regia season, which usually lasts from February to September, the society will be employed at a number of public shows staged in castle grounds and other interesting historical sites throughout the length and breadth of the British Isles. We work with various clients, such as Town or City councils or private clients. Regia makes a charge to appear at nearly all public events, however the individual members are not paid. On some rare occasions, the society may pay fuel expenses, or “hardship money”, but the society seldom earns enough to be able to do this. As well as public events, informal training weekends are held regularly, at which the members have a chance to learn or improve skills, civilian or military, without being under public scrutiny. Authenticity requirements are slightly relaxed at these events and there is rarely a set dateline. Military training at such events can often involve combat games and fighting in woodland, and the civilians have the time to complete projects which they can't always do at a busy show. The online diary is regularly updated with these events and your Group Leader will be reminded about upcoming events. Please don't expect your Group Leader to contact you all the time to keep you up to date with what is going on, but you can ask if you are unsure. If your group has “hearth nights”, then attend them as often as possible to keep abreast of what is going on locally. Several times a year, the society gets asked to provide personnel for media work. 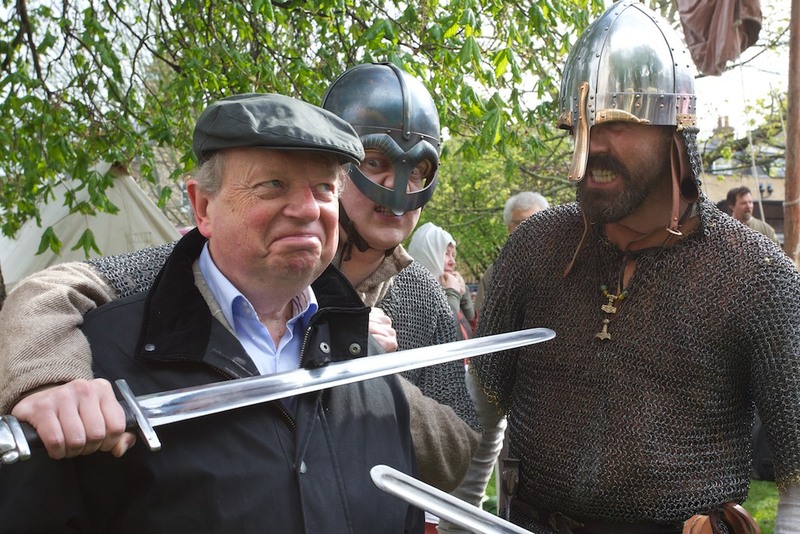 The great majority of this work is for television, although our members have worked on major feature films such as The Lord of the Rings, Gladiator and The 13th Warrior. To be honest, if you've noticed costumed bodies doing things in documentary TV programmes concerning our period of interest at any time in the last fifteen years, the likelihood is that you've seen Regia members at work; whether it be atmosphere shots in Simon Schama's History of Britain, informative cameos in Time Team, or a fishing boad in Game of Thrones! We do not work for nothing and anyone taking part can expect to be paid, treated like a human being and get overnight accommodation and food and drink where necessary. I'm afraid it isn't just a question of putting your hand up and saying “yes please”, you'll have to have suitable kit for the production and we'll need to have known you for a while, too. That said, if you are keen to be involved, keep an eye out for opportunities and make yourself known when one comes along. There is, of course, a downside. You must be able to be available at relatively short notice and be able to take time off work/college if necessary. Location work is often cold and damp or hot and dusty, necessarily in draughty castles or in the country far from modern buildings and amenities. There is a lot of standing about and waiting for the crew to set the next shot, then doing the same thing several times as they change the camera angles. But we never have any trouble finding intrepid souls willing to get their faces in the frame! We also supply replica artifacts for museums and interpretation centres and can produce such things from our own research to the highest guaranteed standards of accuracy. 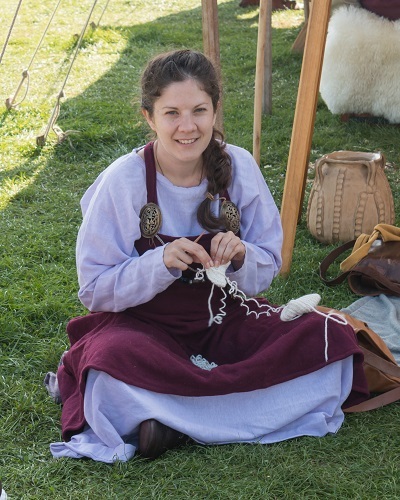 Our civilian projects are many and varied and we can offer our members a wide range of interesting things to be involved in, such as cooking, spinning, dyeing and weaving, smithing, leather and wood-working etc. The “Living History Exhibit” (LHE) comprises a working village of large tents and workshelters (reconstructed from archaeological evidence and manuscript illustrations), which acts as a portable base for our on-site activities. It represents the variety of temporary structures you may have seen at a large cattle market for example a thousand years ago. If you are interested in the civilian side but are a novice to crafts, our “experts” will be only too pleased to pass on their knowledge. If you are already an expert, you will find in the LHE an atmospheric and friendly environment in which to demonstrate your skills. 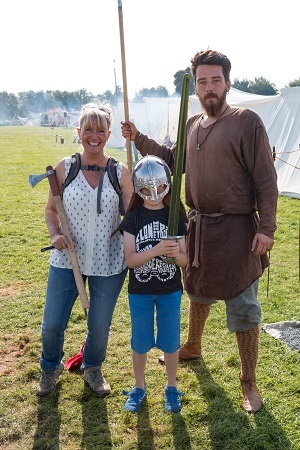 However, the exhibit is not only manned by craftsmen; you will find children at play, warriors relaxing and showing off their wargear at the armouries, even an active clergy of monks, nuns, priests and bishops caring for the spiritual well-being of their flock. The LHE operates slightly less formally than the battlefield. It is forever changing and growing and therefore has to be flexible enough to cope with new ideas and sudden bursts of enthusiasm! If you have no civilian skills but still wish to take part, then you will be very welcome. It won't be long before you find your niche and settle into a project. You may find yourself researching something that no-one else has yet thought of. If you belong to a group that has no LHE of its own then contact the National LHE Co-ordinator. You will still be very welcome. If you have an authentic dog, or other animal that you wish to take on site, then please contact the LHE Co-ordinator who will give you full details about whether or not this will be possible before you take it to a show. Many members often bring pets to shows and this is seldom a problem, but it is always best to double-check. What is expected of you at a show? Basic Kit — A tunic/dress, trousers, shoes – you may be able to borrow these from your group for your first show. Camping Gear — You will need somewhere to sleep and something to sleep in. Food and Drink — Depending on your group and the location of the show you may need to take food with you. Any equipment you borrow is your responsibility – treat it well and return it clean and undamaged. When you join you will be provided with a basic clothing guide and a new members handbook. This will expand on the contents of this section and show you what you need to wear and how to go about making it. Most shows have a similar structure, however some may require a greater input than others, depending on the type of client. The Living History Exhibit is usually open from around 10am to 5pm, or whatever times the client requires within reason. It is imperative that all 21st century items are removed from sight by opening time. All civilians living on the LHE are expected to be on site for most of the day. For the warriors, morning training starts around 10:30am. Muster for battle is usually at 2:30pm, with the battle at 3pm. Combat usually continues after the battle in the form of “circles of honour”, “circles of treachery” or similar. Each show is different and the organisers will try and mix it up a bit to keep things interesting, but shows generally fall into that basic setup. Training is essential for all new members, and this is where you will have the chance to be tested by the Training Officer or his deputies. Do not carry inauthentic bags, coats etc, do not smoke or wear glasses or sun glasses where the public can see you. Do not drink from cans and bottles, or eat ice-creams etc (it is perfectly all right to do this away from the site). Please avoid being photographed by the press with these things. Refrain from swearing in front of the public even on the battlefield. Warriors should not leave their weapons lying around the LHE. Weapons left on the floor can be broken or stolen, and may trip up a member of the public or an LHE civilian. Wet grass can make weapons rusty and unsuitable for use (only rust-free weapons are allowed on the field). Please use the designated armouries and look after your own property. If asked a question by a member of the public, to which you do not know the answer, please do not make one up! There is bound to be a member nearby who will help. You never know who you might be talking to. 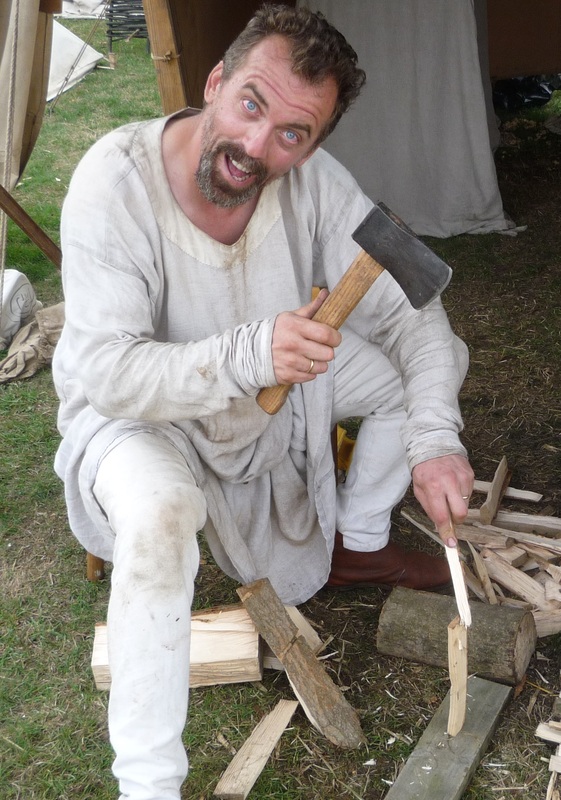 Archaeologists love coming along to events to see what we do! If you are not in kit please do not sit in-between the battlefield ropes or sit around the fire on the LHE. The public do not know that you are a member of Regia and will assume that they can do the same. As well as major public shows, a number of our members do school visits and demonstrations within Key Stages Two and Three of the National Curriculum. This is a very important part of the work of the society. A typical visit bould be full morning or afternoon session, or involve several day visit. It would include a brief talk, followed by inter-reactive demonstrations using reconstructed artefacts. In fact, for some members of the society, this has become a profession.